“Don’t try to imitate my voice, or my cadence. Just discover your own. Be your own natural self.” -Milton H. Erickson, M.D. Milton Erickson was one of the greatest innovators in psychotherapy and therapeutic hypnosis. He demystified hypnosis, and he created new and revolutionary approaches to working with the language of the unconscious. He conversed with it directly and brought new healing possibilities into the world. This DVD set contains 35 hours of Dr. Erickson conducting training sessions with a group of select students. It was filmed from October 3rd through October 12th, 1979, in the small room next to Erickson’s office in Phoenix, Arizona. This first volume consists of the first 12 hours of this training on six discs. Footage has been minimally edited to preserve as much as possible the experience of Erickson himself. Optional subtitles facilitate your listening. During the training sessions, many students conversed with him, went into trance, then returned home and enriched their lives. Erickson’s directness and his comfort with his own unconscious made it safe for them to deepen their experience of trance. Watching these DVDs is the closest you can come to learning directly from Erickson himself and sharing in the experience that many people had in his presence. All you need to do is relax and enjoy listening to him on unconscious levels. As a professional, you can observe his artistry and integrate what you learn into your own ways of working. Erickson was clear about the negatives in life and moved with them with such wit, humor, and acceptance that in his own way he transformed them. He was committed to the human possibilities for joy. Perhaps the more you listen, the more you can experience yourself in new ways. As you open your heart, you can develop new perceptions about the complexity and beauty of life itself. 35 videotaped hours of Erickson teaching in the intimacy of his private offices in Pheonix, Arizona from October 3rd-12th, 1979. 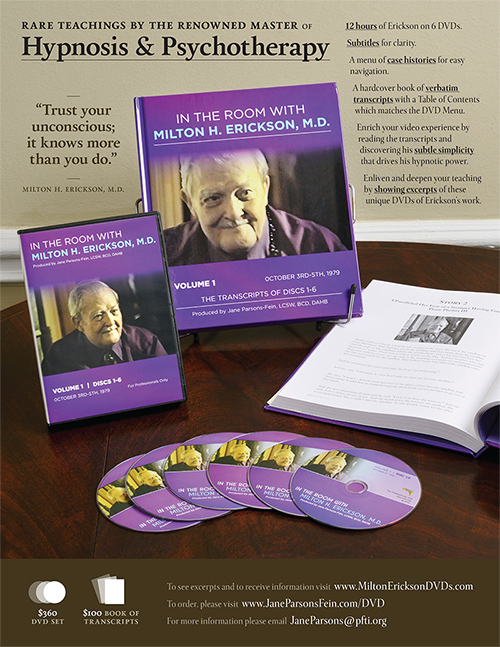 “In the Room with Milton H. Erickson, MD”, please click here. A complete transcript in book form (260 pages) is also available for purchase.